The animal population is exploding. Each year millions of unwanted pets are born and most are treated like "living garbage" and disposed of. The primary causes of pet euthanasia are the failure by owners to have their pets spayed or neutered and animals that are abandoned or relinquished to shelters because of obedience problems. This is tragic and reprehensible.. but also preventable. A simple procedure with overwhelming results. The obvious reason spaying and neutering is to prevent unwanted, accidental pregnancies. There are many more benefits, though, that are good for the pet as well as the owner. For their own sakes, all female dogs or cats should be spayed unless they are going be professionally bred or shown. It does not matter if she will ever be allowed outdoors unsupervised, the physical benefits of an early spaying operation are so great that there is no valid reason not to have it performed. In addition, behavioral problems that are related to sexual drive are avoided in a spayed female pet. There simply is no truth to the old belief that a female puppy should be allowed to have one heat or one litter before she's spayed. There are no benefits to be gained from waiting and many to be gained by an early spaying operation. A pet in heat will bleed, and consequently spot the carpet and furniture. Owners who have indoor pets have to cover the furniture to avoid this spotting. Carpet also will need to be neutralized to remove the smell and the stain. Although there are little pads that can be worn with a strap, most pets find them uncomfortable and try to take them off. A female pet that is spayed before her first heat has a greatly reduced risk of developing ovarian, uterine, or breast cancer, the second most common malignancy in pets. In addition, she will never develop pyometra (an infection of the uterus). Pyometra can become seriously life-threatening and require an emergency spay operation. These infections very commonly occur in older, unspayed females. Of course, an early spay operation also prevents an unplanned, unwanted pregnancy. If your unspayed female puppy does become accidentally pregnant, it can be potentially damaging to her health, since she is very young. A six-month-old puppy is, in no way, suited for motherhood. As to the argument that spayed female pets always get fat, this is not necessarily the case. It is true that spayed pets can be more prone to obesity, but that's because as a female puppy nears physical maturity, she becomes somewhat less physically active and requires fewer calories for energy. Physical maturity often follows shortly behind a spaying operation. Therefore, the spaying is often blamed if a puppy begins to put on weight. If you do not overfeed your pet and give her plenty of daily exercise, she will not gain too much weight. If you don't, she'll get fat, whether or not she's been spayed. An unspayed female also may suffer from a disorder known as "false pregnancy" which mimics all of the physical and behavioral stages of pregnancy, even though there are no fertilized eggs. 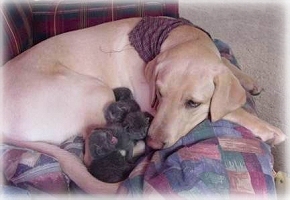 It is quite common in pets that are very dependent on their owners, and can occur even when no mating has taken place. Some females go through a false pregnancy every time they come into heat. A very troublesome side effect of having an unspayed female is the necessity of keeping her away from unwelcome Romeos and keeping them away from her. Males will appear on your doorstep, hang around your yard, and fight one another. In addition to these problems, female cats and even some dogs may "cry." You think your pet is in pain and take it to the vet only to find out it is in heat and looking for a mate. Castration doesn't affect hunting ability or watchdog behavior. He most likely will be less aggressive in some areas, especially toward other males . As with altered females, male pets will not get fat if given a good, balanced diet and enough exercise. One aspect of male canine behavior is aggression towards other males. As a male reaches full physical and sexual maturity, he becomes more and more protective of what he considers "his" territory. His definition of "his" area tends to change, and the boundaries enlarge, until sometimes an entire square block or country mile falls within his territory. Often, owners are not aware of this until a tragedy occurs, and their male or another male is severely hurt or even killed. "But he's always so gentle" is a common cry of an upset owner in these circumstances. And he is nice until another male invades property that he considers his own. Then his male territorial instinct overrides any social behavior he may have learned, and he defends his turf, sometimes to the death. Along with this instinct comes roaming behavior. A sexually active male must patrol the boundaries of his property and constantly widen them. In addition, he's always on the lookout for receptive females and, if there is a female in heat within many miles, he'll find her. Along with this comes the potential to be hit by a car or otherwise injured, or become lost. Often, a male hangs around the area for days on end, apparently forgetting that he even has a home. Terrible fights can occur when several males pursue a female in heat, even if she is confined indoors, and the resulting veterinarian bills may be staggering. Research shows us that of all the positive behavior changes that are a result of neutering, roaming shows the greatest degree of change. An uncastrated male may indulge in territorial urine marking and urinating on every upright surface he can find. This is usually related either to a female coming into heat somewhere within his range or another male moving into the neighborhood. You may not be aware of either occurrence, but you soon will know it when your housetrained pet has suddenly "broken training" and is marking up your house. In the absence of other male animals, males may also take out their aggressive territorial protection on humans. Overprotectiveness of family members may manifest itself by growling or nipping at visitors in your home. Other sexually related behaviors of male dogs can include mounting human legs, climbing up on people, and even knocking children down and climbing on top of them. This is especially frightening and dangerous if a dog is large. For male cats, a neutered male is less likely to spray (almost all unneutered male cats spray). They also yowl as if in terrible pain. You may think your cat is in pain and take it to the vet only to find out it is in search of a mate. Neutering makes life more pleasant because it removes some of the behavioral traits with which people find it difficult to live and traits that may land the pet in a shelter. The operation itself is certainly not cruel, but a fairly simple and routine procedure that actually helps the pet. When done on a young animal, it entails at most one or two days of discomfort. After the operation, the animal will continue to be monitored. Some veterinarians choose to keep the animal overnight for observation, but most animals that go in the morning for surgery can go home late in the afternoon to rest and recuperate. It's good for your pet. It reduces the risk of certain reproductive cancers and diseases for both males and females. Spayed or neutered pets also generally live longer lives. For females, it eliminates the heat cycle and therefore, the nervousness, blood and unwelcome males. For males, it stops the mating desire, reduces mounting and the tendency to roam. It's good for you. Usually less expensive to license, a discount is given if your pet is spayed or neutered. It reduces the risk of unwanted litters. There will be no more problems with blood stains, males breaking into your yard, pets running away in search of a mate, and the job of taking care of and finding homes for an unwanted litter. Your pet will be happier, and so will you.